Harvesting is not just for machines! Harvesting equipment can’t easily maneuver around docks and get close enough to the shoreline. 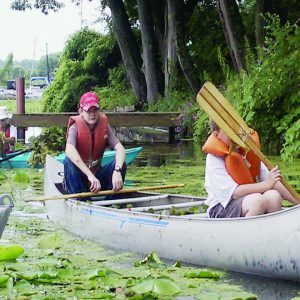 Each year, to help with the effort to control aquatic invasive species, volunteers help with a water chestnut hand-pull harvest. Helpers turn out on the weekends in July in canoes and kayaks. The district provides a brief educational talk before the event starts. Maxwell Creek volunteers – thank you! Are you interested in helping? Let us know by filling out a volunteer form. 1. Maxwell Bay had 17 volunteers (in the pouring rain) and harvested about 1.5 tons of immature water chestnuts. 2. The Sodus Bay Improvement Association, which hosts a self run program on Saturday of Independence Day weekend, has been hand harvesting for the past ten years. Due to their continued efforts the sightings of the water chestnut were scarce! They only harvested a couple 30 gal. trash bags for upland disposal. Congrats to the SBIA for their continued efforts! 3. The Sodus Creek hand pull was held in conjunction with Save Our Sodus Inc. and had 30+ volunteers who harvested over 4 tons of water chestnuts! 4. The Bay Bridge Hand pull was held in conjunction with Sodus Bay Improvement Association (SBIA), Water Quality Control WQCC, and Save Our Sodus and hand harvested about 2 tons in 1.5 hours of work before they were rained out! Congratulations to all that helped!